Dates: Open weekends and select days November 23, 2018 through January 1, 2019. Main Street Christmas will feature sparkling light displays and illuminated towering trees. Sweet and savory treats will include s'mores; spiked egg nog; holiday-flavored coffee and hot chocolate; peppermint and mocha fudge; festive funnel cakes with peppermint topping; specialty holiday platters of sliced turkey, smoked turkey leg and chicken with cranberry sauce; chili bowls; and hot soups. Tinsel Town USA will celebrate the spirit of the season with patriotic red, white and blue lights as a tribute to the good old USA! Kids can join Santa in his workshop at the North Pole for a fun photo opportunity. New seasonal characters will include an ice princess, snowman, gingerbread man, reindeer, toy soldiers and silly holiday elves. 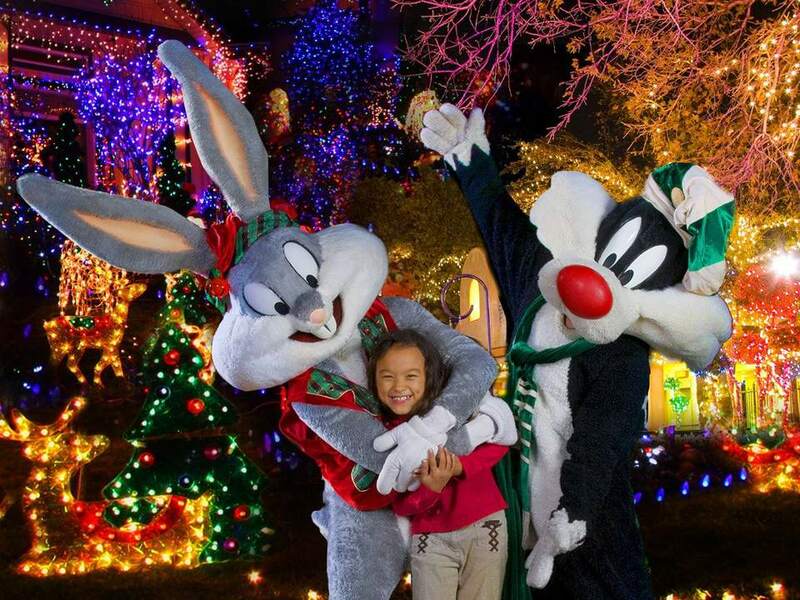 In the Whimsical Wonderland, kids will delight to see colorful lights, giant holiday bulbs and their favorite Looney Tunes characters all dressed up for winter. Entertainment will feature a grand stage production, hilarious stunt show, live carolers and a special show just for kids. Tickets are as low as $41.99 if you purchase them online and $69.99 at the Main Gate. Buy tickets in advance so that you do not have to wait in line. Visit early in the season. The park will get most crowded later in the season and during school winter break. Arrive early to get the most out of your visit. Head to the most popular rides first. Lines are sure to get longer late in the day. Address: 13710 Central Ave. Upper Marlboro, Maryland. (301) 249-1500 and (800) 491-4FUN. Six Flags America is located on Route 214, Central Avenue, approximately five miles from I-495 just 30 minutes from downtown Washington, DC. From the Capital Beltway (I-495): Take exit 15A, Central Avenue East. The park is located approximately five miles from the exit, on the left. From Baltimore and Areas North: Take I-695 to Exit 4, I-97 South. Follow I-97 South to Exit 7, Route 3 South towards Crofton/Bowie. Route 3 becomes Route 301 South at the Route 50 intersection. Stay on Route 301 South for approximately five miles. Exit onto Route 214 West, Central Avenue. The park is located on Central Avenue, approximately three miles from the exit, on the right. From Virginia and Areas South: Take I-95 North to the towards Baltimore. Take Exit 15A, Central Avenue East. The park is located approximately five miles from the exit, on the left. Six Flags America in Upper Marlboro, Maryland offers a full day of fun with more than 100 rides, shows and the largest water park in the Washington, DC area. The theme park is owned by Six Flags Entertainment Corporation, the world’s largest regional theme park company with $1.2 billion in revenue and 18 parks across the United States, Mexico and Canada. For 55 years, Six Flags has entertained millions of families with world-class coasters, themed rides, thrilling water parks and unique attractions. Read more about Six Flags America.